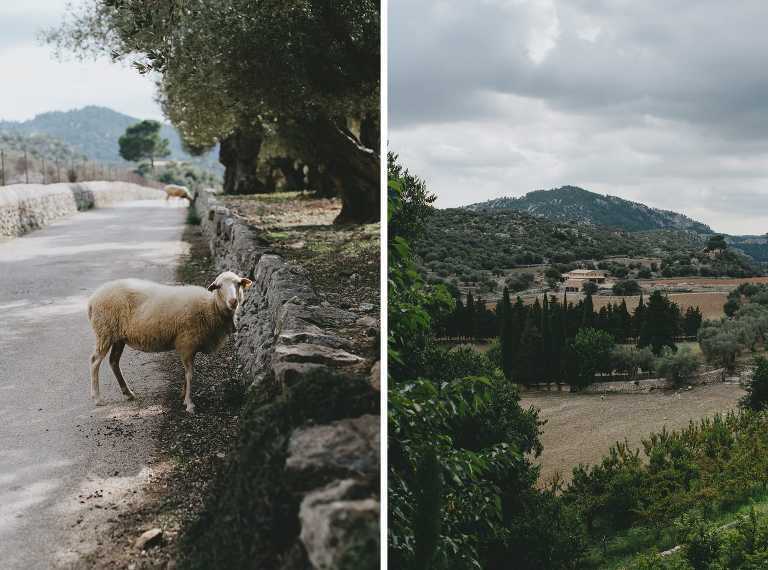 The wedding in Mallorca I bring you today in my blog starts with this amazing rural landscapes, the surroundings of the Finca Comassema, a rural property in in the heart of the Sierra de Tramontana. A villa in the middle of nature with different ambiences, ideal to celebrate both a civil ceremony and a wedding banquet in Mallorca. This was the place chosen by César, a Spaniard living in London and Lily, an American of Taiwanese origin. 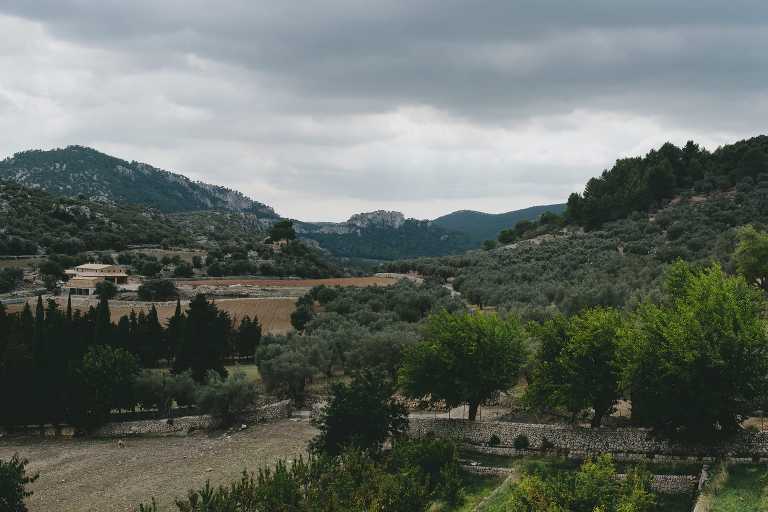 The couple met and currently live in London but they agreed that their wedding would be a destination wedding in Spain, concretely they decided to get married marry in a rural wedding in Mallorca. The day before the wedding, the guests were already on the island, so as a prelude to this international wedding in Mallorca the couple held a welcome cocktail, at El Balneario de Illetas, a paradisiacal place with spectacular views of the Balearic Islands Sea, that the guests thoroughly enjoyed. 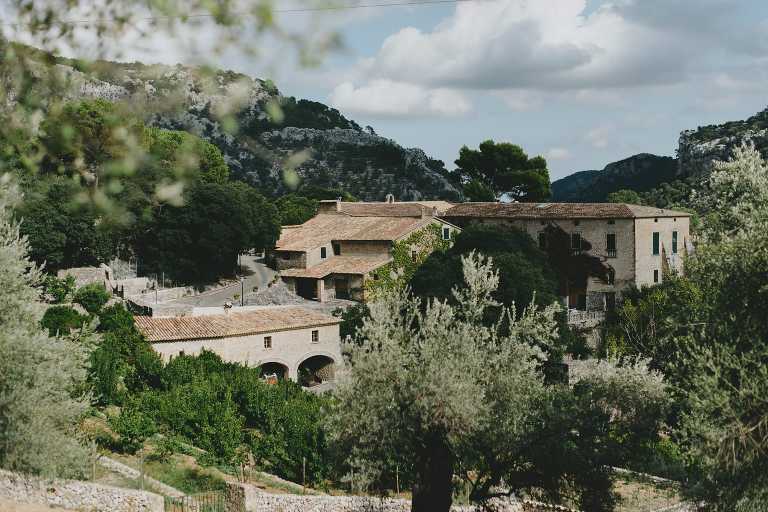 For the big day, the bride got ready at L’ Hermitage Hotel & Spa, a charming hotel in Mallorca, that used to be a Majorcan seventeenth century monastery surrounded by the splendor of the Mediterranean vegetation. Once everything was ready, the guests started arriving to the villa where this rural wedding would be held, they were received with welcome drinks. It was certainly a very international wedding as guests arrived from all corners of the planet, all of them very smart and eager to share this day with the couple. The wedding ceremony was held at one of the nicest exterior areas of the villa, a pl direct views of the Orient Valley. The place was decorated for the occasion with white wooden chairs and a white carpet. The civil ceremony was officiated by two friends of the couple who officiate the ceremony simultaneously in Spanish and English so everybody understand it. First the page boys and the flower girls made their entrance throwing olive twigs followed by the bridesmaids, and finally the bride, who was radiant. The wedding was very emotional with readings from friends and the bride and groom’s parents. After saying I do and exchanging rings we move to the wedding celebration, which took place also on the exteriors of the villa. It is the great advantage of getting married in a wedding destination in Spain, the Mediterranean weather allows you to get married outdoors in almost any season. The styling and planning of the banquet and the whole wedding was carried out by Caprichia with whom I have worked in other occasions with great results. The whole wedding was rural and Mediterranean themed and dinner was no less. The guests were seated in round tables and chairs decorated with olive branches and a big bow. Each table had the name of a place that newlyweds had visited telling the story of their visit and why that place was important for them. Also there were garlands decorating the whole dinner setting that gave a magic touch to this rural wedding in Mallorca . Dinner was very convivial with family and friends speeches being made. The cake, as it couldn’t be otherwise, was a typical ensaimada that everyone loved. After the wedding banquet, some sparkler kicked off the party that ended late at night, as it should be! As a wedding photographer in Mallorca, I hope you enjoy the pictures!